Today makes it the 84th day the Nigerian government of dictator Muhammadu Buhari and its Army led by Lt-Gen. Tukur Buratai, exhibited the most irrational and unprofessional conduct known to mankind, in a bid to forcefully quench the Biafra agitation, by invading the house of the leader of the Indigenous People of Biafra, IPOB, Nnamdi Kanu at Afara Ukwu Ibeku, Umuahia and then took him away after shooting dead many unarmed Biafrans in and around his home, in the name of operation python dance II. It is on record that before the Nigerian army invaded Kanu’s home and abducted him on 14th September 2017, he was slated to appear at the Federal High Court, Abuja for his trial on October 17, 2017 which he had announced that over two million Biafrans shall accompany him to court. He was fully prepared to appear in court without fear, regardless of the intimidation of the Nigerian government and its machineries, to expose the lies and evil perpetrated by the government before the world. There was no warrant of arrest from the court to arrest Nnamdi Kanu, of which if there was, it is not the responsibility of the army but that of the police to carry out the order. There was no reason whatsoever that should give rise to the invading of Kanu’s house by the Nigerian military. The military invasion is a clear evidence of the dictatorial tendencies and exhibition of President Muhammadu Buhari, a mockery of the Nigerian judiciary who granted Kanu bail and murder of democracy in Nigeria. It is not in doubt that Nnamdi Kanu is in custody of the Nigerian army because he was at home when they invaded his apartment and killed everyone on sight including dog and fowls, and ransacked his rooms. From the video clips, picture evidences of the army invasion and intelligent investigations by independent journalists and media houses, it is certain that no human being can escape such operation carried out with heavy war machines. 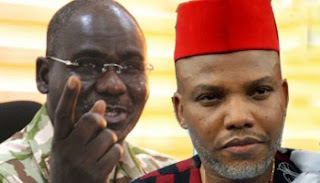 The Chief of Army Staff, General Buratai should produce Kanu and stop playing hide-and-seek games. If peradventure, he cannot produce him because they have secretly killed and buried the IPOB leader, then there is need for the court to invoke “the doctrine of Last Seen”, as provided by Section 36(5) Chapter IV of the 1999 Constitution (as amended). “Last Seen Doctrine” in law, stipulates in cases of murder, where there is no explanation for the death or disappearance of the deceased and the defendant was the last person to be seen in company of the deceased, then circumstantial evidence can be used to link the defendant to the death of the deceased and prove the charge against the defendant beyond reasonable doubt. There is no burden on the defendant to prove his innocence and explain the death of the deceased but the burden remains on the prosecution to prove that the defendant killed the deceased. It is the duty of the prosecution to lead sufficient evidence to establish a prima facie case against the defendant to require an explanation for the disappearance of the deceased and the absence of a reasonable explanation can support the inference of guilt. The Nigerian army overstepped its bounds and humiliated the judiciary by invading Kanu’s house without prior notice or court order and if the court fails to invoke the “last seen doctrine” in this matter as needed, then, what is left of the Nigerian judiciary is done for. Mazi Nnamdi Kanu is the leader of over 70 million Indigenous People of Biafra, Director of Radio Biafra and Biafra TV. Biafrans are conducting themselves in the most civilized manner in this matter but it won’t continue that way. The day they will spew their venom if the needful is not done, and that will spell disaster for the Nigerian state. I'm sick and tired of reading these write-ups and too much talk. Until, IPOB and all genuine Biafran groups genuinely seeking freedom from a murderous Islamic sharia state of Nigeria organize and free their land and people no matter the cost it will entail, we will never be respected. Freedom is not given but forcefully taken. Buhari, Buratai and Hausa-Fulani and their co-conspirators will never take Biafrans seriously until we organize, unite and finish this last battle. We Biafrans have been killed enough and humiliated beyond measure. It’s time to organize a referendum and be ready to enter into our promised land. Enough is enough!